Our Art Guide is a risograph publication which features thoughtful and curated listings of our favorite art spaces in Portland, Oregon. This project was created in an effort to expand our scope beyond just documenting the contemporary art scene and sharing it on our Instagram, and aims to accomplish this movement outside digital media to something physical and tangible for the community. 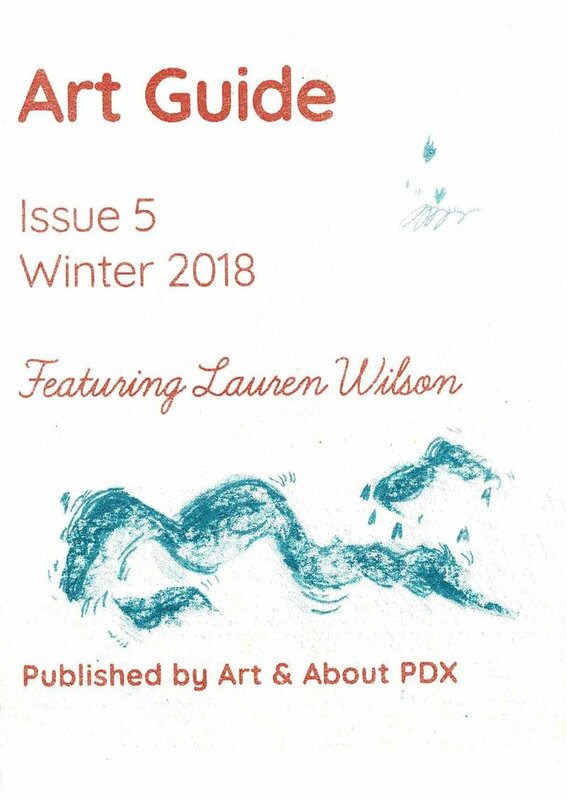 Issue I was printed January 12, 2018 at Outlet in Northeast Portland. What’s the significance to the choices you made in regards to the paper and ink? I wanted to choose colors that reflected the season. There are so many flowers blooming in Portland right now so pink and green made sense to me. Could you describe the choice of imagery used in your Art Guide, why you chose it and any related meanings? I have worked with milagros, Mexican folk charms, over the years. They are used for healing, protection, or luck, all of which I am needing at the moment. I scanned the charms, cut them out and scattered them in the design. Materials: Pink paper, green text, red images. The imagery and text for my issue of the Art Guide come from Early American embroidery samplers that were made as part of a young girl's education. I chose red and blue ink on off-white paper so that it would feel American. In part this is just a nod to the source materials, but it's also because I have always cringed at the blindly patriotic feel of these colors together and I wanted to try to reclaim them. I'm thinking a lot lately about imagery that is coded as feminine in our culture and have been working from decorative motifs drawn from embroidery samplers. Drawing each stitch is a kind of ambivalent homage. It mirrors the labor involved in making the sampler, but it is not tied to the historical emphasis on mastery and technique that the tradition imposed. Translating the stitches and fabric to drawing enables me to push against this rigid format a bit on my own terms. Materials: Cream paper, red and blue text, red illustrations. Materials: White paper, orange text, teal illustrations.